The DAP-1360 provides 64/128-bit WEP encryption and WPA/WPA2 security to protect your network and wireless data. 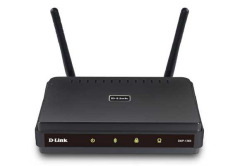 This device also supports Wi-Fi Protected Setup (WPS) to quickly and securely setup a wireless network. In addition, the access point features MAC address filtering and a disable SSID broadcast function to limit outsiders access to your home and office network. WATASHI # WCI122 (3.6mm) plus a leg.